Only a handful of cooking techniques are really foolproof. Roasting squash is one of them. To screw it up you have to throw the squash in the oven, drive away in your car, and never come back. 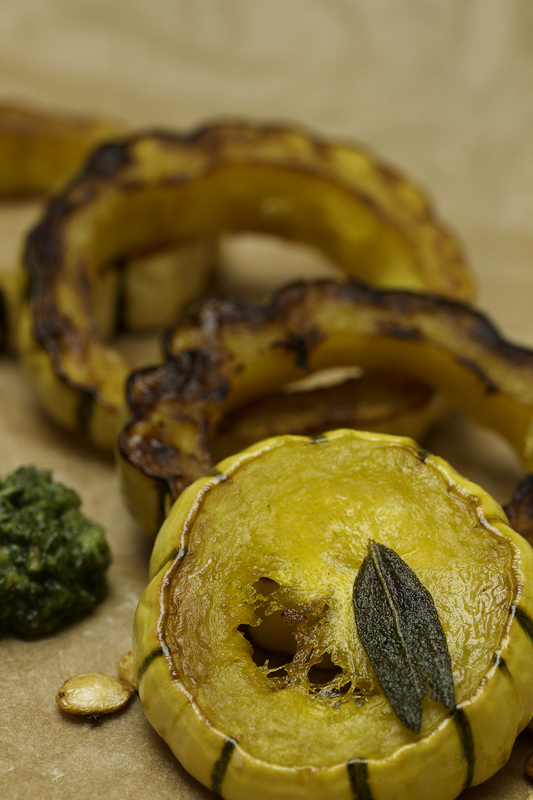 Roasted Squash with Sage Pesto is only slightly more complicated. You add stuff to a blender, pulse a few times, and that’s it. You do have to be careful not to add too much sage (see Jody’s comments below). All of this is good for beginning or timid cooks. These days I find myself increasingly fascinated by back story, asking myself Why do we eat this? or Why do we eat this way? or Where did this come from? I’ve been thinking about squash a lot lately, perhaps because I’ve been reading Charles C. Mann’s book, 1491, in which he tells the remarkable and largely unknown story of the Indian cultures that populated the Americas before the arrival of Columbus. The flyleaf of the book offers three interesting examples of the revelations within its pages–that there were probably more people living in the Americas in the mid-15th century than in Europe, that cities like Tenochtitlán (the foundation of modern Mexico City) had greater populations than European cities of the time, and that pre-Columbian Indians in Mexico had a highly sophisticated system for cross breeding plants. Their success with corn continues to stand as the world’s single greatest feat of genetic engineering. The tomato ranks as another triumph, the transformation of a wild Andean plant with thumbnail-sized fruit, usually inedible, into the recognizably modern tomato. Squash, tomatoes, corn, sunflowers, garden peppers, and most varieties of beans were first grown by Indians. According to Mann, three-fifths of the worlds crops under commercial cultivation today find their origins in Indian agriculture. Now you know why my wife asks me to keep the level of discussion to Good morning until she’s had a second cappuccino. With the exception of the acorn squash–winter fare in my family; halved, baked with butter, honey and cinnamon–I don’t think squash even registered in my culinary consciousness until I was in my mid-twenties when I tasted squash ravioli sauced with sage butter. As in most culinary ah-ha! moments my tongue did most of my thinking and what it thought at that moment was that squash and sage go together really really well. And we have Meso-American Indian culture to thank for that. 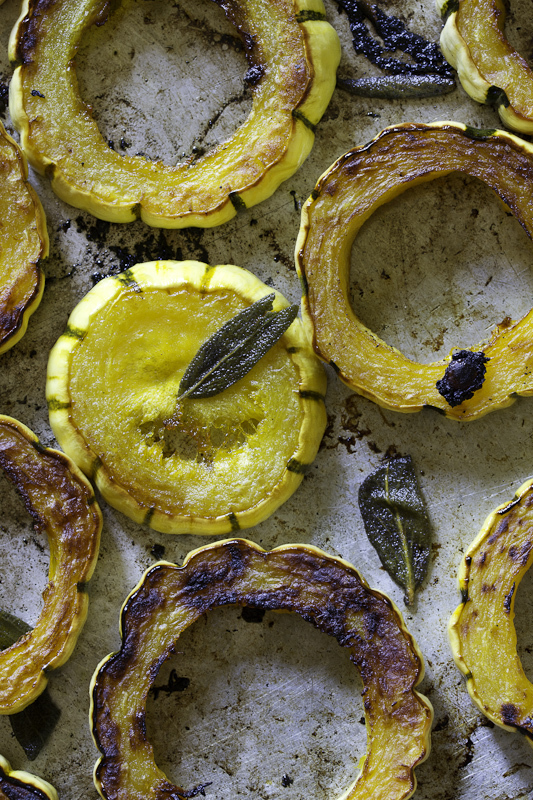 Toss the squash with the olive oil and season with salt and pepper. Toss again with the whole sage leaves if you’re using them. Arrange in a single layer on a shallow pan and roast on the bottom shelf in the oven for 30 minutes. Flip the squash and roast an additional 10 minutes. 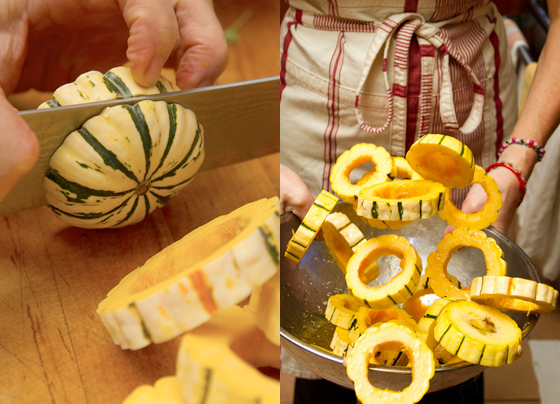 When both sides are golden and the squash is tender, remove from the oven. Arrange on a warm platter, drizzle with lemon juice and sage pesto. Serve immediately. Combine the parsley, sage, garlic and walnuts in the bowl of a food processor. Pulse 4 to 5 times. Add the water and the oil in a steady stream as the machine in running until you have a paste. Using a rubber spatula, transfer to a small bowl, stir in the cheese and season with salt, pepper and sugar. Add the additional oil and a drop or so of water if it seems too dry. Just before serving, stir in the lemon juice. Try to keep them in the bowl! One summer we spent the last 2 weeks of August in Menerbes, in the South of France, staying with my old college roommate Amy, her husband Francisco and their son Gabo. On our first tour of open-air Vaucluse markets we were greeted with flaming red piles of tomatoes. But in only two weeks they were elbowed aside by a new arrival – squash. On our last market day mountains of hubbards, pumpkins and buttercup filled the stalls. Our visit, the tomatoes, the summer, all gone in a flash. For me squash equals fall. My favorite approach to squash is simply roast it and then add a great big flavored sauce or garnish. Gorgonzola and a drizzle of balsamic vinegar, pomegranate molasses and mint, or this sage pesto. A few words on this pesto. Sage is a powerful herb, and shares a quality with saffron in that a little too much tastes like A LOT TOO MUCH. The dusty element in its flavor steps forward and dominates everything else. Use a scant ¼ cup of sage to 2 cups of parsley and you should be fine. I also added a pinch of sugar and a squeeze of lemon juice as an extra bit of counterpoint. Wait until just before serving to add the lemon juice–if you add acid, and the pesto sits, the beautiful deep green color will start to fade. 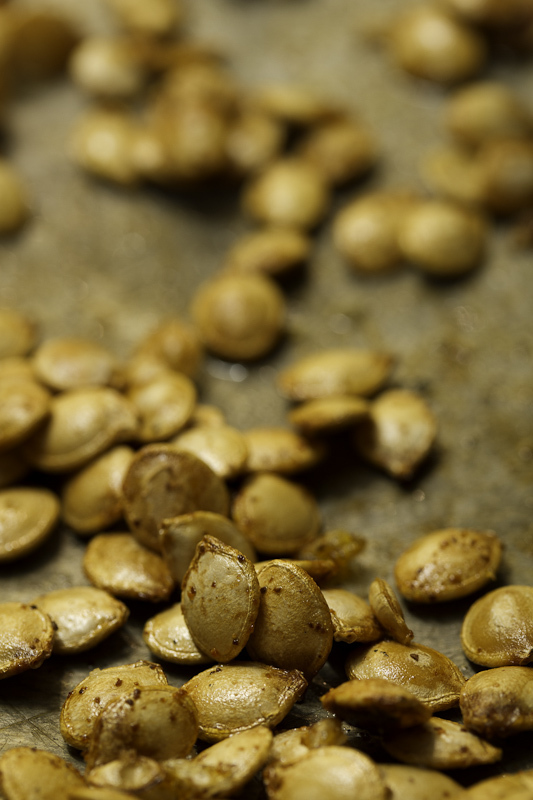 I love pumpkin and squash seeds, and the frugal part of me can’t bear to see them go to waste. 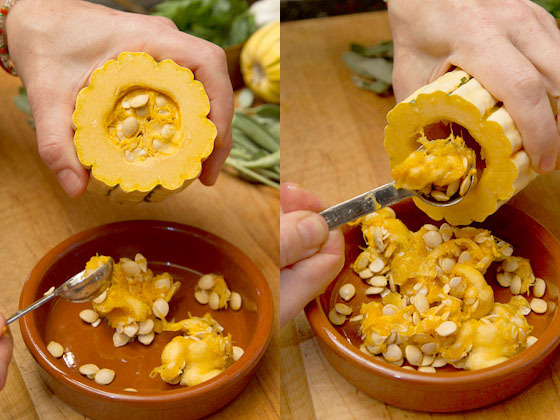 Put the mass of squash pulp and seeds in a large bowl and fill it three-quarters full with water. Work the pulp with your fingers to release the seeds from the fibers. The seeds will float. Skim the seeds and spread them on a sheet pan. 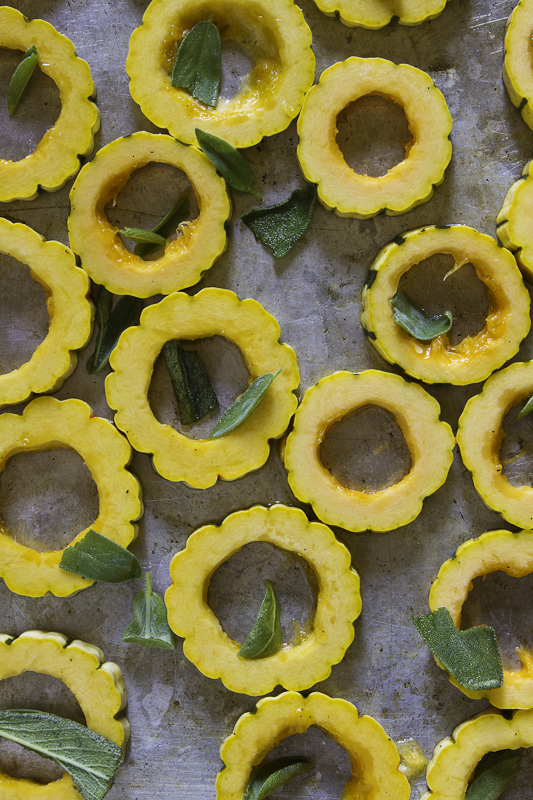 Bake in the oven with the squash for 3-4 minutes or until dry. Remove the tray from the oven, drizzle a tablespoon of oil over them, then season with salt, smoked paprika and a pinch of sugar. Smear everything about, then return the pan to the oven. Roast until the seeds are golden brown and crisp, about 8 more minutes. Use as a garnish, or eat like popcorn with a great beer. 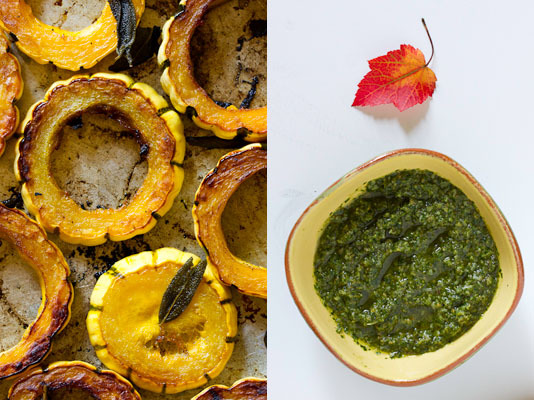 This entry was posted in Easy, Side dish, Vegetarian and tagged pesto, sage, Squash. Bookmark the permalink. Thank you for the sage pesto recipe! With the threat of frost last night, I realized that i was potentially going to lose a wonderfully large crop that I had been tending all summer. Now I know what to do with it! We have a gorgeous sage bush in the front of our house that, even though it blossoms all summer long, doesn’t seem right to use in the heat. I’m happy to know about a sage pesto, and thank you so much for the tip about tempering it with the parsley. I’ve received an acorn squash in this week’s CSA, so this recipe is just waiting to be made this weekend! 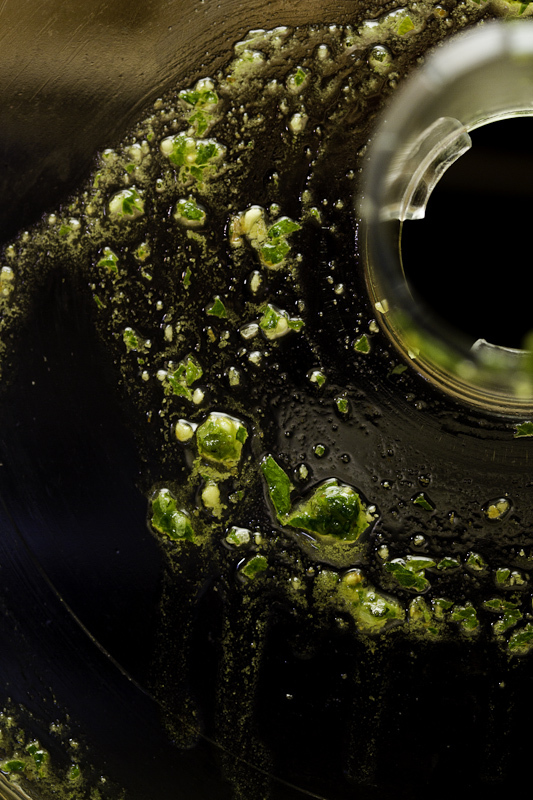 you could try making the pesto without the cheese…and then freezing it so you have it in the winter. Just add fresh cheese once it’s defrosted. Beautifully written (of course), great recipe (looks like!) and good timing — as our sage bush continues to be lonely. Not for long. You’ve inspired me. I think your blog is onto something. Thanks Naomi… your sage will be happy. Is it squash time already? Today I’m looking back at summer, but the weather this week until today has been nippy enough to get cold weather food cravings. 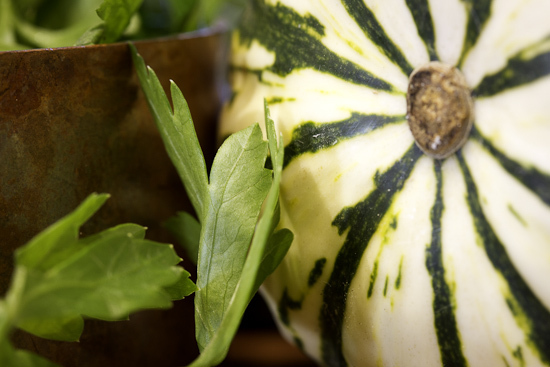 Sage and squash, perfect! I like the idea of toning down the sage a bit with parsley. Bee–u-tiful photos, too! Yummers! Can’t wait to try this one. Thanks for sharing it. Sounds like a fascinating book, Ken, I may have to grab a copy. I’ve never been big on squash, though I prefer Winter over Summer varieties by a long shot. Thank you for this nearly fool proof recipe, I’ll try not to forget them in the oven. Just whipped together the sage pesto and squash and served with some broccolini and left over pork chops. Wicked Good Keeper! Thanks Jody and Ken and thanks Steve Nill for turning us on tho your blog. Sounds divine…can’t wait to try it! I just roasted the last of my autumn squash and whipped up this pesto to go alongside it. Was I supposed to add the sugar when I flavored it with salt and pepper? I couldn’t find that step in the recipe and just wanted to make sure I added it at the right time. I’m in love with this recipe! 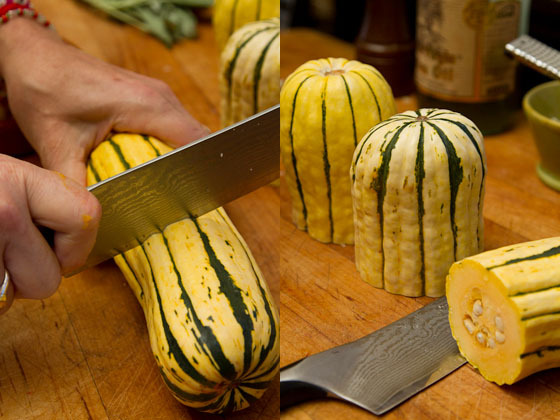 I’d never cooked this kind of squash before because I thought you couldn’t eat the skin and it seemed too difficult. But it’s delicious, and looks so great on the plate (although all those O’s looked a bit like the Olympics logo…. ).